Today, a major decision by the Canadian Transportation Agency (CTA) came out requiring the City to either take steps to officially discontinue use of the Prince of Wales bridge for rail operations, or bring it up to a state of repair where it could be used on 12 months notice (order attached as a .pdf below). It’s a decision with profound financial repercussions for the City, but could be good news for those advocating for a cycling/pedestrian connection between Gatineau and Bayview Station. For those who might not be familiar with the background, in 2016 representatives of the proposed MOOSE rail line filed a complaint with the CTA noting that the rail connection between Bayview Station and the PoW bridge had been cut. As a federally-regulated railroad, the City has an obligation to maintain its rail line. Closing a rail line is subject to a regulated process, which MOOSE complained had not been followed. Today, after a year of legal wrangling, the CTA has essentially agreed that the appropriate process hasn't been followed, and issued a decision ordering the City to tell it by April 30 how it will either bring the bridge into a state of repair such that rail could be run on it with a year’s notice (if for example the feds were to order that a competing rail line should have access to it), or to initiate the process to discontinue this portion as a rail line. The City will take some time to determine how it wants to proceed. In the meantime, it’s worth thinking about whether the decision could or should accelerate the process of bringing LRT to Gatineau, including with a pedestrian/cycling connection. It should be clear that the City’s goal has always been to establish that rail connection, and before the 5th/Clegg bridge was funded it was the City’s top priority for a cycling/pedestrian facility. Just under a year ago, on March 7, I and Councillor Egli brought a motion that passed Council authorizing the Mayor to begin discussions with Gatineau’s Mayor on that future connection. A first meeting took place just this month to study and make recommendations on questions related to interprovincial transportation, including active transportation. It’s also worth noting that the 2018 budget allocated $260,000 toward design work to begin refurbishing one of the bridge’s piers. There are several outstanding questions in my mind tonight as the City looks at its next steps. First, it seems to me that the City should appeal or otherwise push back at the April 30 deadline to describe how it will proceed. Estimates for how much it will cost to repair the bridge vary wildly, and no engineering study has been done in the past few years that takes into account further degradation of the structure. If Council is going to decide whether to proceed with renovating the bridge, it needs up-to-date, accurate information. We simply don’t know, in my view, what it will cost to bring rail, pedestrian and cycling traffic over the bridge. Secondly, Council will need to understand what the CTA will accept as a plan moving forward. Will it accept a two-year timeframe to bring the bridge up to snuff? Five years? Ten? We have long range financial plans for the City and for transit that don't include a bridge renovation that could cost anywhere from a few tens of millions to a couple of hundreds of millions of dollars. Dealing with that new pressure won’t be easy to figure out. And, we’ll need to understand whether funding can be secured from the other levels of government to assist in the effort. The decision provides little guidance to the layperson about how long a rail connection can be left unused. It states: “It does not follow…that lines can be allowed to fall into a state of permanent or long-term inoperability… To comply with the legislative scheme, a railway company must ensure, at minimum, that it is in a position to restore a line that has not been discontinued within a reasonable period of time, in order to meet its obligations.” We need to understand what the CTA considers that means. Once we understand the costs and have better insight into what kind of plan the CTA would find acceptable, we’ll be in a better position to grapple with the consequences of pursuing either planning for the re-connection of the bridge, or discontinuing it. To be clear, I consider that the bridge should be put into operation as a rail/cycling/pedestrian connection. 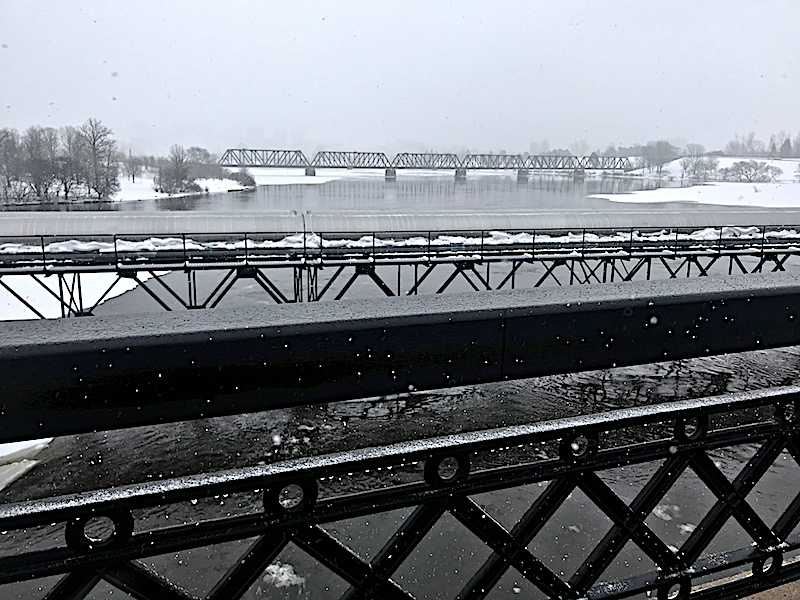 It would be a major part of solving some of the interprovincial congestion that is increasingly diminishing the quality of life in parts of our ward, and have immense economic and environmental benefits for the cities on both sides of the river. Today’s decision forces us to consider how we’ll accomplish that sooner rather than later. It is possible, of course, that the City will appeal today's CTA order and, if successful, simply reverse it. However, it behooves us to pursue a longer-term solution to the outstanding questions surrounding the bridge’s future. While I would fully support the City appealing this order, largely due to its unreasonable timeframes, I do think this is a wake-up call and should be a spur to action. Better to begin planning for the bridge’s reinstatement and enhancement today than continue to let the questions linger and the bridge become more expensive to repair by the month. To do that, we need information - and a little more time.